President Barack Obama and First Lady Michelle Obama wished the troops a merry Christmas with a visit to a U.S. Marine base in Hawaii on Tuesday. Barack Obama’s appearance with servicemen at a Christmas ceremony was his last public stop in Hawaii before he cuts short his vacation and flies back to Washington to return to negotiations over the fiscal cliff. The president is expected to arrive in Washington early Thursday, the White House said Tuesday night. Michelle Obama and the couple’s two daughters will remain in Hawaii. In the past, Barack Obama’s end-of-the-year holiday in his native state had stretched into the new year. The first family had left Washington last Friday night. Congress has been expected to return to Washington late Thursday. Before he departed for Hawaii, Barack Obama told reporters he expected to be back in the capital the following week. Automatic budget cuts and tax increases are set to begin on January 1, which many economists say could send the country back into recession. So far, the president and congressional Republicans have been unable to reach agreement on any alternatives. Lawmakers have expressed little but pessimism for the prospect of an agreement coming before the New Year. On Sunday, Sen Kay Bailey Hutchison, a Texas Republican, said she expects any action in the waning days of the year to be “a patch because in four days we can’t solve everything”. The Obamas were spending the holiday at a rented home near Honolulu. 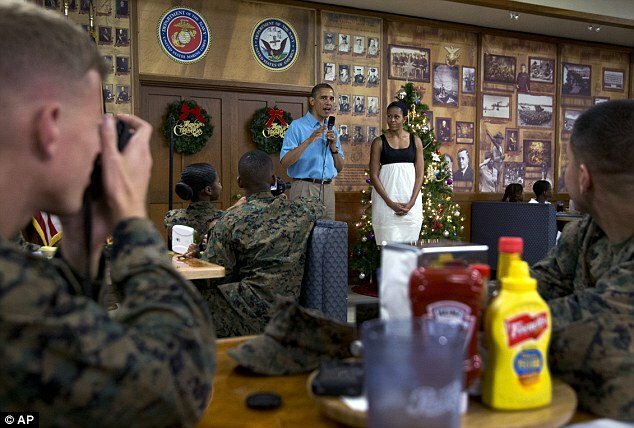 On Christmas Day, the president and first lady visited with Marines to express thanks for their service. “One of my favorite things is always coming to base on Christmas Day just to meet you and say thank you,” the president said at Marine Corps Base Hawaii’s Anderson Hall. He said that being commander in chief was his greatest honor as president. Barack Obama took photos with individual service members and their families. On Christmas Eve, Barack Obama called members of the military to thank them for serving the nation, then joined his family for dinner, the White House said. The Obamas opened gifts Christmas morning, ate breakfast and sang carols. Friends were joining the Obamas for Christmas dinner Tuesday night, the White House said. President Barack Obama and his wife Michelle celebrated Christmas from their tropical Hawaii getaway as they released a more festive looking picture of themselves onto their Twitter feed. Despite leaving for Barack Obama’s home state of on Friday, the pair released the seasonal picture to the White House twitter feed today and spoke together during the weekly presidential address of how much they enjoy a White House Christmas. Both the president and his wife spoke of the joy at spending the Holidays with loved ones and paid a special tribute to the men and women of the armed forces – serving abroad with their families in Afghanistan and in other deployments across the globe.